Pitching Coach Herm Starrette Explains Movie "Bull Durham"
. I love the interaction on the mound, those conferences and pep talks. I had to ask a real coach what a real mound meeting is like. What might be the funniest thing ever said — even if you don’t laugh until returning to the bench. 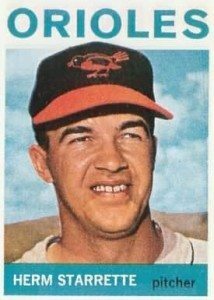 Starrette received World Series rings as Baltimore’s minor league pitching coordinator in 1970, and as Philadelphia’s pitching coach in 1980.